Amman forms a great base for exploring not just Jordan, but the wider region as well and does, despite popular belief, offer much that is of interest to the traveller. The city is generally reasonably well-organized, enjoys great weather for much of the year and the people are very friendly. Although Amman can be difficult to penetrate at first sight, the city holds many surprises for the visitor. Visit Amman's Roman Amphitheatre, its many art galleries or the newly opened Jordan Museum, while an afternoon away on a chic cafe terrace, take a course in the University of Jordan or stay in luxurious hotels and dine on the region's varied and delicious cuisine. Modern shopping malls are increasingly abundant in Jordan but open air souqs are what many travellers will remember most. Amman is experiencing a massive (some would say: reckless) change from a quiet sleepy village to a bustling metropolis, some of whose neighbourhoods seem hell-bent on wanting to imitate Dubai. Amman's roads have a reputation of being very steep and narrow in some of parts of the city but the city has state of the art highways and paved avenues. The steep terrain and heavy traffic remains challenging for pedestrians and for the rare cyclist. New resorts and hotels dot the city and there are many things for the traveller to see and do in and around Amman. -The Jordan University Hospital was established in 1973. The university has also affiliations with King Hussein Cancer Center, which was the first Cancer Center outside of the United States to be accredited by the JCI Disease Specific Certification (DSC) - (November 2007). We have research projects with the Stem Cell Therapy Center and King Hussein Cancer Foundation. So not only will our students be working at the top research institutes and facilities in Amman, they may develop great contacts and connections for the future. One meal per day at the hospital cafeteria. The flats are located close to the hospital and are a 10 minutes from walk from campus. Taxis and busses are also available. 2. 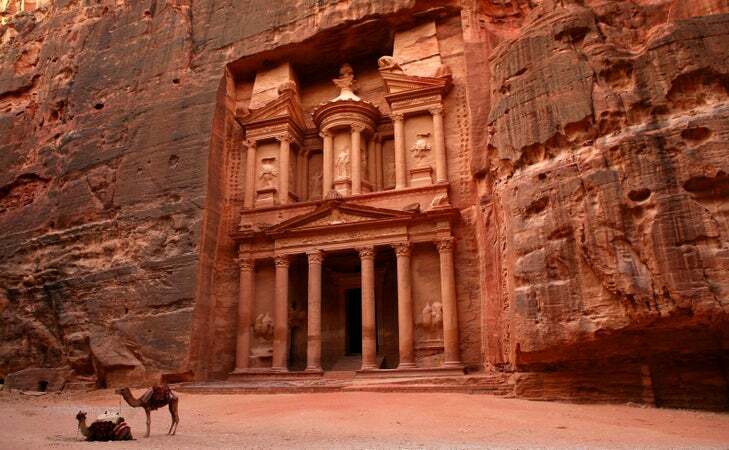 Trip to Petra, Wadi Rum and Aqaba (the golden triangle) Details and dates of those trips are set to include the majority of the exchange students in Jordan. 3.Dead sea, which is considered the lowest point on earth with the finest resorts, views and activities. 4.In addition to the above major trips, University of Jordan Local Committee arranges for group trips to close sites in Amman, North of Jordan and nearby cities and sites and finest caffes. The Citadel(known in Arabic as Jabal al-Qal’a) Perched on top of the city’s highest hill these ancient ruins in the middle of Amman are absolutely beautiful, especially in the late afternoon. This site is recognized for its historical importance and its 'special place in the hearts of Amman residents.’ The Amman Archeological Museum is located on Citadel Hill, near the Temple of Hercules. The collection spans thousands of years and features a large variety of items. Several noteworthy pieces include the Ain Ghazal statues, which are some of the world’s oldest statues, the famous Dead Sea scrolls, the ancient vases, a copy of the Mesha Stele and preserved rhino body parts from more than 200,000 years ago. 22 Roman Theatre Located in the heart of downtown Amman, the Roman Amphitheatre is the biggest Roman Theater in Jordan. It was built during the reign of Antonius Pius in the second century AD to seat approximately 6,000 spectators and was oriented to the north to keep the sun off of the audience. The theater is divided horizontally into three sections, the topmost of which is called the Gods. Jordan Museum of Popular Tradition: This small museum, immediately to the left as you enter the Roman Theatre, has well-presented displays of traditional costumes, jewellery and face masks. A separate gallery displays mosaics from Jerash – your best chance to get up close, as little remains on site. The dress code for the clerkship is SMART CASUAL. NO AIRPORT PICKUPS AFTER MIDNIGHT.